Michelle Freeman is a Counseling Resident in the process of completing both her LPC and MFT licensure. 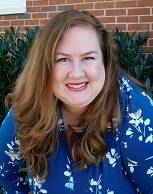 She received her Masters of Arts in Clinical Mental Health Counseling from Regent University and her Bachelor’s in Psychology from the University of Virginia. She holds certification in Trauma-Informed Care; EMDR; and Marriage, Couples and Family Counseling. She has ten years of counseling experience: three as a practicing clinician in a variety of settings as well as seven years’ experience working with university students and women in a pastoral counseling setting. During those years, she cultivated her interest in attachment research and interventions with the Ainsworth Attachment Clinic and was delighted to join the Clinic’s Evaluation Team as well as the Circle of Security Network. She is passionate about walking with clients as they navigate life transitions and helping them to explore their story through a lens of hope and restoration. Michelle works with adults, families, and children but specializes in university students, women’s issues and families with a history of disrupted parent-child relationships. Michelle approaches her work through an attachment and trauma-informed lens. She has worked with a variety of issues from stressful life adjustments, mood disorders, personality disorders, trauma and abuse recovery and sexual/gender identity. Michelle also provides faith-based counseling for those interested in processing their story through a faith focus. Therapy services are offered for a wide range of issues such as: Anxiety, Depression, Emotional Regulation, Abuse/Trauma, Sexual/Gender Identity, Stress, Adjustments, Grief /Loss, Relationship Difficulties, and Family Concerns. Couples, Marriage, and Family counseling are also offered. Faith-based counseling is available at client’s request. Please note: at this point we do not accept insurance for outpatient services, but bill a low co-pay. We accept all credit cards as well as cash and check.